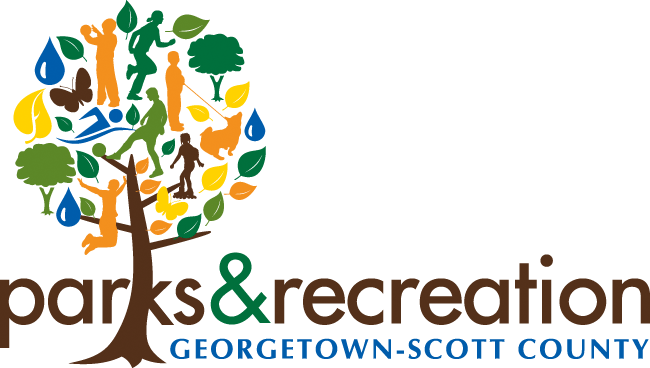 The purpose of the snow and ice removal plan is to describe the locations and services provided to the community during and after snow events by the Georgetown – Scott County Parks and Recreation Department. The aim of the Snow and Ice Removal Plan is to return the department to normal operations as soon as feasible within the limitations of our resources, weather conditions and the safety of our staff. Please keep in mind that flexibility is needed to adapt to the variety of circumstances and conditions during a snow or ice storm and changes to this plan may be made without notice. The primary function of the Snow and Ice Removal Plan is to organize snow and ice response efforts so that safest possible access to parks and recreation facilities are available during and after a snowstorm. The plan identifies the priorities in which facilities are cleared. Facilities are prioritized by citizen usage. The plan is designed to direct cost-effective snow and ice removal efforts during periods of inclement weather. Detection: The forecast of an anticipated snow event; weather conditions are monitored by following local, regional, and other weather service providers. In addition, managers and staff observe weather locally. Snow Teams: Snow Team 1 is made up of Parks and Recreation Facilities Maintenance employees and lead by the Facility Maintenance Manager or their appointee. This team will focus on indoor facilities such as the Pavilion. Snow Team 2 is made up of Parks Maintenance employees and lead by the Parks Maintenance Manager or their appointee. This team will focus on outdoor Park facilities. Each team will work in their appointed area or may be called to work as a unit depending upon the circumstances. The decision to activate the teams to work as one unit will be made by the Parks and Recreation Department Director. Monitor: Once accumulation occurs, parks and recreation maintenance employees are informed by the manager(s) that snow operations will begin and to report for duty. Deployment Decision: The manager(s) assigned to the snow event is responsible for the deployment of snow teams in their area of operations. Level one is considered for snow and ice events where accumulation is little or none and no additional snowfall is expected. Deployment for level one snow events is typically during regular work hours. Selected locations such as the Pavilion and Ed Davis Learning Center are plowed and treated as needed. Some locations will not be plowed or treated because the snow is expected to melt on its own in a relatively short period of time. Full deployment of all snow team members is not typical at this level, and occurs as needed. A limited number of park maintenance employees are assigned to these duties. Any remaining employees are assigned regular scheduled work assignments. A level two deployment is considered for snow events with accumulations of 2 – 8 inches with or without the possibility of additional accumulation. Maintenance employees are deployed as needed for snow and ice response. If Scott County Schools are not in session the Pavilion will operate on a minimum one-hour delay. If there is 3+ inches of accumulation of snow and/or ice the Pavilion will operate on a minimum one-hour delay. Snow teams initially focus on the Pavilion parking lot and sidewalk. Crews will begin plowing at 4:30 am Monday – Fridays, 5:00 am Saturdays, and 10:00 am on Sundays. Depending on the severity of the storm the parking lot may not be entirely cleared and therefore, only part of the parking lot will be available for usage. The Ed Davis Learning Center parking lot and sidewalks are given second priority. Snow and ice removal will begin once the Pavilion has been completed. All other facilities will be addressed only if resources are available. Assist with the city and county snow and ice removal efforts as requested. Transition from a level two to a level three deployment is based upon the predicted forecast of snow storms with accumulation of 8 inches or greater. Snow teams will be deployed as it is deemed safe to begin work. If a declaration of a snow/weather emergency is declared by the Mayor or Judge Executive, there will be no deployment of parks and recreation staff for snow removal until the emergency status is lifted. Facilities will remain closed until further notice. Please consult the department’s website: www.gscparks.com, Facebook, and Twitter pages for detailed information on facility openings, closings and program information. Local new stations will also be contacted to post information.